Easy Vegan Breakfasts and Lunches Cookbook Review Vegans Eat What? Help support VegansEatWhat? by ordering this book via our Amazon.com! 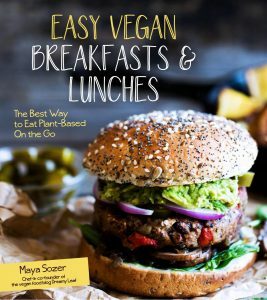 If you’re pressed for time and want nutritious & delicious vegan fare, Maya Sozer’s first cookbook is a great choice for any vegan or veg-curious kitchen! Maya Sozer is the creator of Dreamy Leaf, a popular vegan food blog. She is also the photographer behind the gorgeous photos that showcase her scrumptious recipes. With her husband Emre, she shares a love of vegan food, the planet and its inhabitants. This love is reflected in her beautiful cookbook and recipes. Easy Vegan Breakfasts and Lunches is a winner! Many of the dishes could easily perform “triple duty” for breakfast, lunch or dinner. The cookbook is designed with tantalizing photos reflecting the finished product of the recipe on the facing page. We would have preferred the font to be a bit larger and darker than the currently favored “faded” font colors used in many current cookbooks and magazines but it was manageable. This is Sozer’s first cookbook, and we hope to see more from her. The recipes are easy to prepare and relatively quick as well. The ingredient lists are not long and the individual ingredients are easy to find. Most importantly, the results are very tasty! As she states in her book, “The taste of a dish is not proportional to the complexity of the recipe.” She has found a way to develop a magical combination of ingredients and seasonings to produce beautiful dishes that are visually appealing, nutritious and a delight to the mouth. 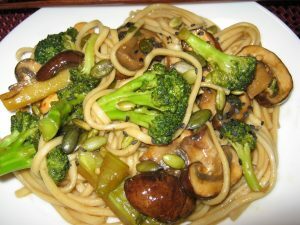 We tried these recipes: Curried Veggies, Cozy Quinoa Lentil Minestrone, Fettucine Alfredo, Cauliflower Rice Stir-Fry, Saucy Rice Stir-Fry, Spicy Red Lentil Soup, Tofu Étouffeé, Chana Masala, Udon Noodles, Quick Bok Choy Mushroom Soup. Below we offer you one of our favorites from Easy Vegan Breakfasts & Lunches. Cook the noodles according to package instructions. Mix together the sauce ingredients in a bowl. Heat the grapeseed oil over medium-high heat. Add all the vegetables and cook, stirring for 2 minutes. Add the sauce and cook for another 5 minutes. Add the cooked noodles and cook, stirring, for another minute to warm the noodles. Add your desired toppings This can be served hot or cold.